2016 Jaguar F-Type R Becomes AWD, But Will It Cut The Beast's Heart Out? The top-of-the-range 2016 Jaguar F-Type R coupe will feature the company's Instinctive AWD system as standard, paired with Intelligent Driveline Dynamics stability control. Meanwhile the whole F-Type lineup will grow from six versions to twelve. Purists can put down the pitchforks though, as Jag's AWD system in the XF and XJ has "almost a full rear bias under normal driving conditions, but it can divert up to 50% of the power to the front wheels when needed," which MotorWeek seemed to think made up for the perfect compromise between rear and all-wheel-drive. 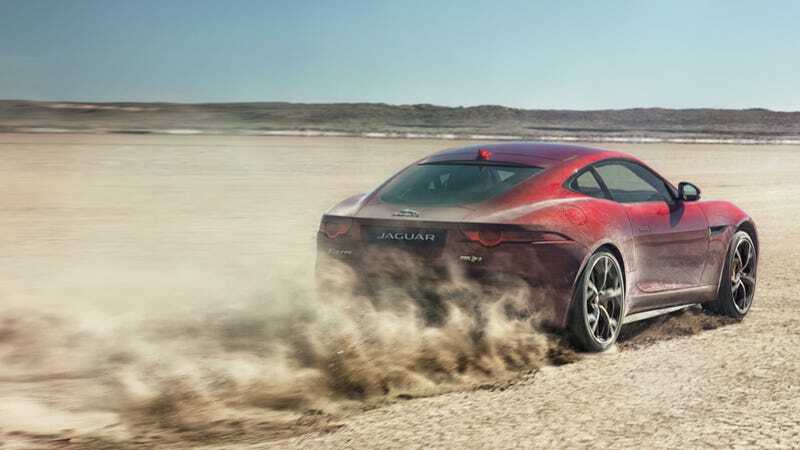 "Our target with engineering the all-wheel-drive F-TYPE was to maintain the engaging rear-drive character that's so important to Jaguar sports cars, yet offer even greater dynamic capability. "said Jag's Vehicle Line Diretor Ian Hoban. The 2016 F-Type R AWD will do 0-to-60 in 3.9 on to with a limited top-speed of 186 MPH. Jaguar will reveal the entire new range of F-Type derivatives at the LA Auto Show on November 19th.